Origin: Kilenso Mokonisa, Oromia, Sidamo. Kilenso Mokonisa is a single plantation, organic, Ethiopian coffee. Its quality is underpinned by the farm owners commitment to quality from seed to cup. A rare, fully traceable, organic, ethically sourced high-quality Ethiopian coffee. It is is predominately available in accordance with region, for example Yirgacheffe and Sidamo (Mid-South/ Great Rift Valley). The distribution, quality control and price is dictated by the Ethiopian Commodity Exchange (ECX). This is great for creating an efficient trading platform. A portion of profits are re-invested in the community, sponsoring over 650 schools in Kilenso Mokonisa. They also utilise modern farming methods to maximise and rejuvenate land resources, and ensure that the natural environment is prioritised in the processing of the beans. This country’s beans are known for their complex flavours of wine and fruit. Its medium acidity paired with a medium body produces a well-balanced taste. 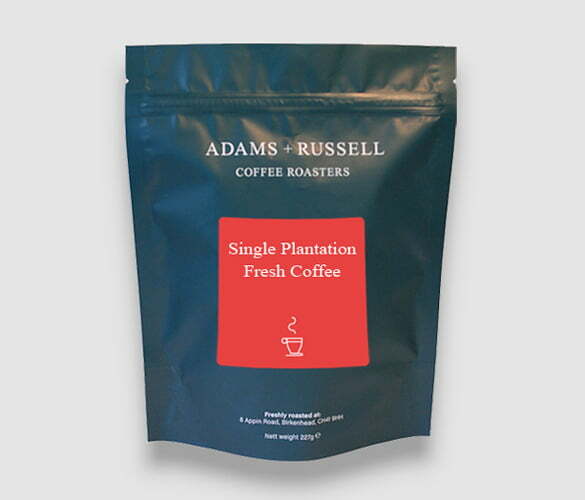 The Adams and Russell Ethiopian Kilenso Mokonisa has delicious notes of juicy berries, vanilla and deep cocoa. The coffee plant was discovered in this country in the 11th century. Its white blossom smells like jasmine and its bean resembles a red cherry. According to legend, the goat herder Kaldi stumbled across the plant when he noticed that his goats were full of energy and wouldn’t sleep at night after they ate some of the berries. He then shared his findings with the local monastery who made a drink with the berries. They also experienced this high energy and alertness. The knowledge of the coffee plant soon began to spread. Very tasty. Will be buying this again; soon. This is seriously good coffee, that is a hidden gem. I have bought organic coffee from many online stores, but I haven’t found anywhere that sells it this cheap and still deliver on time, every time, a coffee I really look forward to drinking every morning. I make mine freshly ground in a cafetiere. This has a depth to that sweet, chocolatey, berry taste, without being earthy or in any way. The taste lasts and becomes quite complex and comforting without having any bitter aftertaste. I can only assume the high standard of roasting ensures I get a very similar roast every bag I buy. Do yourself a favour and buy a bag of these beans, give them a grind, make a brew, see the world in a new light and you’ll not look back!